My black car is officially yellow, so it’s time to break out the asparagus recipes, starting with this spring asparagus and goat cheese pizza! Pizza is a favorite food of mine and I eat it at least once a week. This past week I had it twice, first with the pizza recipe I’m sharing today, and next with impromptu takeout when we were celebrating a friend’s last day at his job. For a lot of people, pizza is a fear food, but really it’s just carbs, protein, fat and sometimes a little veg if you use tomato sauce and/or veggie toppings. Our body doesn’t really know the difference between pizza and other foods that are biologically similar, but (generally speaking) have lower emotional intensity, like cheese and charcuterie plates, or sandwiches. By the time the glucose, amino acids and fatty acids are absorbed into our blood stream, our body doesn’t know where it came from. What makes a food scary are the beliefs we have about it, which are formed from often inaccurate and misleading information from diet culture or the experiences we’ve had with those foods. And of course, the beliefs we have about food can often drive our experiences with it. For example, late night pizza is a pretty standard college tradition. Perhaps you feel like you can’t control yourself around pizza, because you’ve had multiple experiences eating pizza to a point that didn’t feel very physically or emotionally good. If you didn’t believe pizza was a “bad” food, or that your inhibitions had to be lowered before eating it, would you still eaten pizza in the same way? Or felt the same level of guilt afterward? To make fear foods less scary, it’s important to neutrally plan in fear foods throughout the week - you might need the help of a non-diet dietitian for this. Intentionally planning to eat a food at times when you’re not experiencing an intense craving for it will help normalize that food, and prove that you can eat it in a way that feels good for you. So put this spring asparagus and goat cheese pizza on the menu, so you can enjoy tasty pizza for dinner, instead of reserving it for the days you’re exhausted and ravenous after a long day at work. I have a feeling it will be a lot more pleasurable of an eating experience - plus I personally think this pizza tastes better than takeout! While I am usually adamantly pro-tomato sauce on pizza (this is an ongoing ordering argument between me and my pro-white pizza husband), I love this pie topped with garlic oil, two cheeses, crisp-tender asparagus and thin slices of Yukon gold potatoes. Don’t be skeptical of potatoes on pizza - the crispy rounds of potato are so good! And as I’m writing this, I’m realizing proscuitto or bacon would be a very welcome addition. I hope you love this recipe as much as I do! Be sure to share it on pinterest! 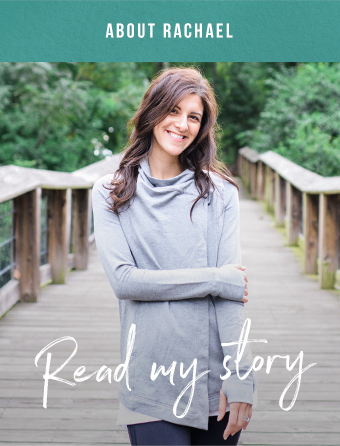 Spreading my recipes helps introduce new people to intuitive eating and non-diet wellness, especially people who might not otherwise come across these approaches. Steam asparagus for 1 minute until crisp-tender. Set aside to cool, then chop into bite sized pieces. Dust pizza dough with a little flour then using a roller or hands, spread into a large round on a pizza stone or baking sheet. Mix olive oil and garlic in a small bowl, then spread evenly across the dough. Top with crumbled goat cheese and mozzarella. Spread potato slices evenly across the pizza, then top with chopped asparagus. Drizzle with olive oil and crack a little black pepper over the top. Place in the oven and bake 15-17 minutes until cheese is bubbly and crust is lightly golden.